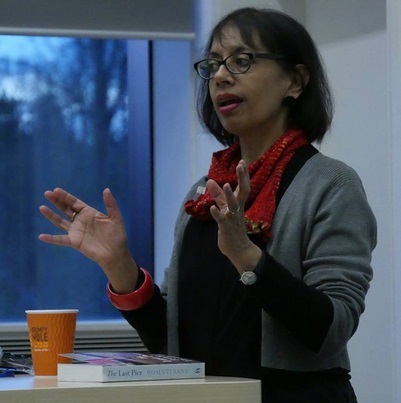 We were delighted to welcome Roma Tearne to the Winchester Reading Series at the University of Winchester, on 24 March. Roma is a Sri Lankan born novelist, artist and filmmaker who left the island in the 1960s at the start of the civil war and now lives in Oxford. This huge personality gripped our attention from the moment she began to speak. She quickly built up a relationship with us, as she does so cleverly in her novels, sharing her ideas and explaining how she weaves her stories around them. She kept us enthralled for over an hour as she drew us into her life as a writer. I managed to read Mosquito, her debut novel, before the evening. This remarkable book captures the tragedy and violence of civil war and its terrible effect on the characters who experience it. But it is not only a story about war; it deals with love and loss as the relationship between the protagonists is torn apart. There are no speculative assumptions about characters in this book. These are felt experiences. I found the sharing of them profoundly moving. However, it is through the poetry of her writing that the strong sense of Sri Lanka is best portrayed. Her pen and her artist’s brush combine, as she recreates its vibrant colours and rhythms, to allow our senses to feast on them. Roma has her feet firmly planted on the ground. Although she delighted us with her anecdotes about presenting her work around the world and getting published, she emphasised the difficulties too. Refusing to be dictated to and pigeonholed by publishers, she has had to fight her way to preserve her identity and become the writer she wants to be. She made it very plain to us that success is not easy in this profession and we must be prepared to fight very hard for it. 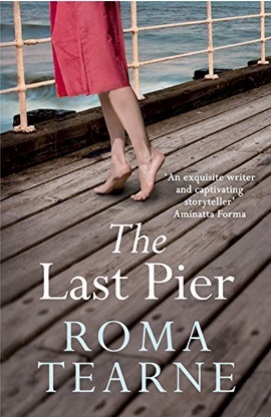 I would like to recommend Roma’s latest novel, The Last Pier, to be launched in April. It is set against the Second World War. I am thoroughly enjoying it. This entry was posted in Winchester Reading Series 2015 and tagged author, Author Talk, literary, MA Creative & Critical Writing, Mosquito, Reading Series, Roma Tearne, The Last Pier, University of Winchester, Winchester Reading Series, writing by Litmus 2015. Bookmark the permalink.